An annual rite of late summer, the Little League World Series was watched with added enthusiasm this year as the first team from Africa qualified for the annual event. For all who tuned into ESPN’s coverage of the LLWS, they know the team from Lugazi, Uganda, was the darling of the week – and ESPN spent many hours talking about the boys and their trip. Jay Shapiro of ESPN the Magazine concluded the beginnings of baseball in Uganda “is tricky, but Lugazi may have been the first real cradle. A missionary group called Unlimited Potential International and started by former minor leaguer Tom Roy brought baseball to Lugazi in the late 1980s.” UPI is based in Warsaw – not the city located in Poland, but rather the city located northeast of Kokomo. And as fate would have it, some of those missionaries who traveled to teach the Gospel and America’s pastime to young boys in Uganda hailed from the City of Firsts. “Fortunately, in 1996 I was given the opportunity by Glenn Johnson to travel to Uganda and use baseball to get our foot in the door to share the Gospel,” said Ron Givens, a former baseball standout himself. With Uganda in the World Series, Givens traveled to Williamsport, Penn., to see the team and its manager, whom he happened to coach and with whom he became good friends during his trips to Uganda. 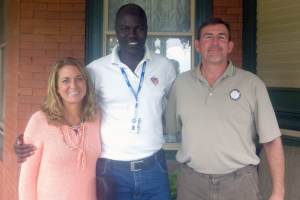 Henry “Bouncer” Odong was also a darling of ESPN during its coverage of the LLWS. Steve Wulf, in an ESPN.com story, said Odong was known as Bouncer “because of his size.” And once again, Kokomo can be thanked as the local missionaries were the ones who gave him his nickname. Givens said Odong had such a passion for baseball that he used to send letters to Kokomo asking for more information about the game. To read the complete story, request your FREE digital subscription to the Sports Journal by filling in the form at the top right of the home page or sending an email request to editor@indianasportsjournal.com. Thank you. This entry was posted in Baseball, Little League Baseball. Bookmark the permalink.